As we find ourselves in the new year, Hogen calls upon poet W. S. Merwin to investigate our asking ourselves the deeper questions. What does it mean to be still? 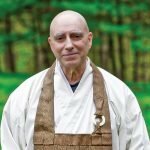 What makes our practice real? How can we fully inhabit our own experience? How do we create a good day? NextMi Hu's "Enlightenment or Not?"